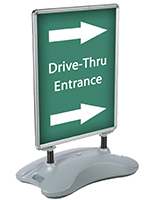 These sidewalk signs enable establishments to advertise goods and services right outside the door with quality pavement fixtures! 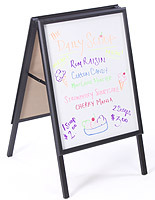 This A-frame signage makes it easy to change out messaging and notices using write-on markers, chalk, or plastic lettering, depending on what type of fixture is selected. 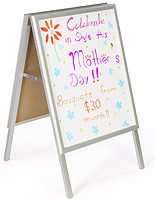 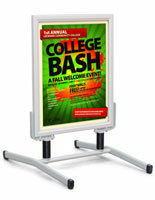 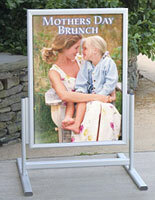 These durable sidewalk signs are weather-resistant but meant to be brought inside at the end of the day or evening. 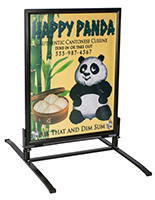 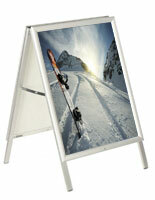 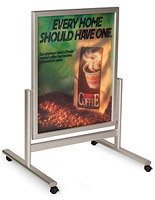 Choose quality indoor/outdoor A-frame signage from this massive selection of retail merchandise! 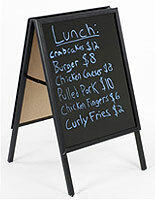 Each of these sidewalk signs boost sales indirectly once placed on a street by attracting walk-in traffic! 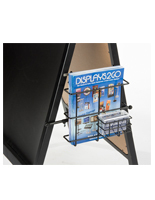 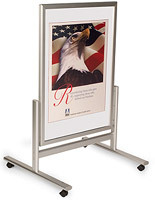 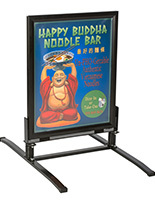 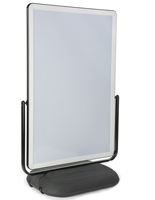 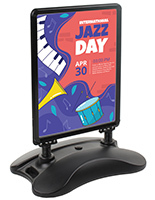 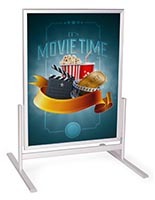 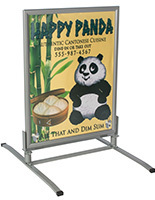 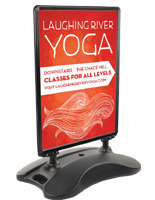 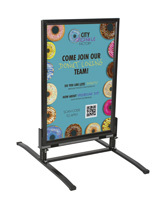 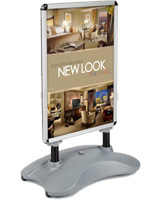 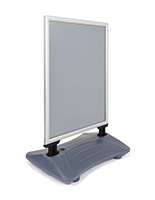 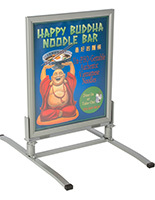 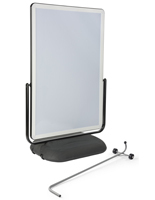 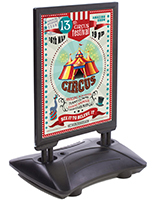 Some of these pavement displays for posters have rubber seals that prevent moisture and water leakage from damaging the unit and snap frames for easy graphic installation. 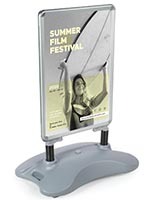 Other sidewalk signs have fillable bases for adding sand or water to stabilize the presentation on a windy street. 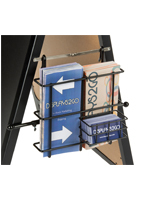 A lid at the top of some of the A-frame signage units protects collateral pamphlets from blowing away in the wind or getting wet from the rain. 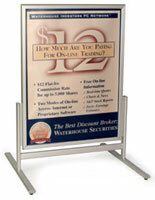 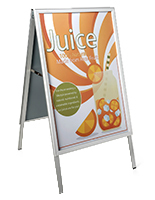 These freestanding sandwich boards, sidewalk signs, for advertising are great ways to boost sales. 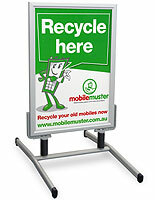 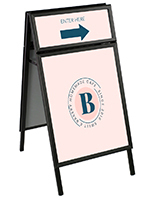 Each of these signs, such as A-frame signage, can be placed right on the pavement outside a store or restaurant. 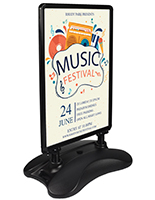 The sandwich boards allow the user to promote menu items or specials, featured performers and speakers, and more. 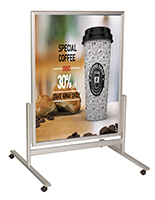 When investing in snap poster frames and bulletin boards it is important that they be durable, and well designed to attract attention from the street! 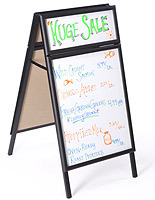 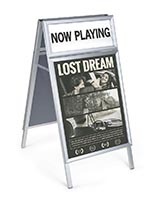 These sandwich boards for real estate offices, beach clubs, and sporting arenas have snap-open design, while others are marker boards for write-on messages (purchase markers, chalk, and lettering separately at this website). 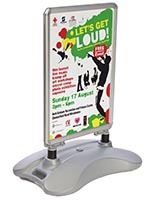 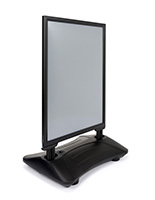 Some of the outdoor advertising features built-in caster wheels for portability, and a non-glare/PVC lens so the messages are easy to read from the street. 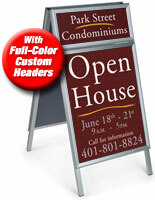 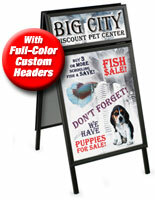 Single and double-sided pavement signs with snap frames are available with custom headers in myriad designs!